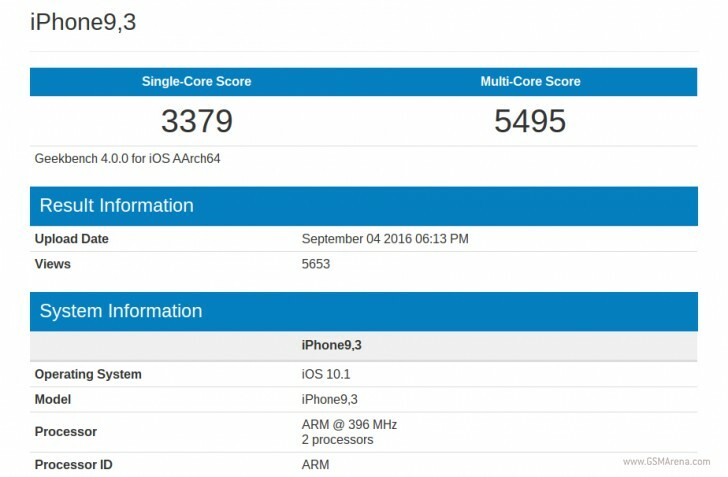 The iPhone 7 Plus has allegedly ran the GeekBench multiplatform testing suite and managed a single-core score of 3379 points. That’s 10% more than what the phone managed back in July when it first appeared on the benchmark’s database. However, when assessing that difference keep in mind that this new test was performed usingthe new Geekbench 4, while the previous one used then-available Geekbench 3. The results are not directly comparable across the two versions of the benchmark, because “Geekbench 3 is normalized around an Intel Core i5-2520M having a score of 2500, while Geekbench 4 is normalized around an Intel Core i7-6600U having a score of 4000”, according to XDA-Developers. Geekbench 4 should overall prove to be much more accurate, but the key point here is this – the same device tested in both Geekbench 3 and 4 will yield different results in each. We’ll need to wait for a bit more time to pass and more devices to be put through the paces of the new Geekbench 4 in order to assess how well Apple’s latest is doing compared to the competition. The iPhone 7 Plus and iPhone 7 will be official on Wednesday following Apple’s dedicated smartphone event.